Remember those sleepovers you had during your youth? Sure you’re no longer in primary school, but that does not mean your days of pyjama parties are over! Whether you are organizing a hen party or a time with close friends, our Girls’ Night In packages are an ideal retreat for female bonding and fun! Your group can stay in one of our lodges and take advantage of all that our facility has to offer. You can take in the delicious, chef-crafted cuisine at our dining room (we can provide menu prices on request) or do your own cooking in our self-catering accommodation. Break the ice at the Kippure Bar (fully licensed) or chill out with a bottle of wine in your own, cosy sitting room. The choice is yours. 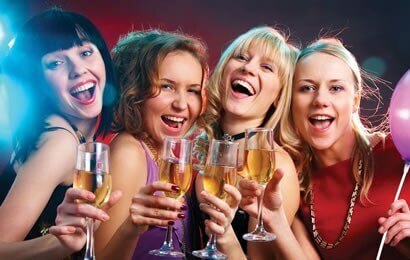 We will work with you to build a customised hen party or itinerary tailored to your budget and desires. You and the girls can chill, laugh and reminisce inside your lodge with wine and a deliciously rich fondue spread. The package includes both chocolate and Swiss styles.